Home Changing the World What’s More Awesome Than Chocolate Bars? When Dylan Siegel learned that his best friend had a rare liver disease in 2012, he decided to do something about it. He wrote a book called “Chocolate Bar,” because in his world, “that’s so chocolate bar” is a high form of praise. This is because Dylan was six years old. Dylan began selling copies of the book for $20 each to raise money to fight the disease. 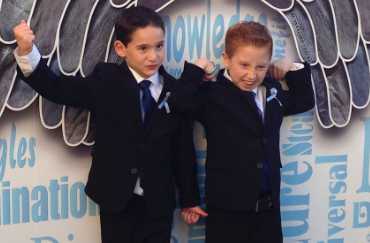 The Global Genes Project, which advocates for rare disease research, honored Dylan and his friend with the RARE Champion Award—typically given to grown-ups. Dylan didn’t stop there. He designed other products for sale, and raised more than $1.5 million. “Kids can change the world, just like any of us,” Dr. Weinstein told ABC News. Watch this video of Dylan speaking at the Sandbox Summit USC. What mattered most to Dylan? What broke his heart about it? What did Dylan decide to do about it? What challenge did Dylan say he faced in his quest to raise $1 million? How did he overcome these obstacles? What does Dylan hope to achieve next? Previous articleRaising Money for a Cause? Give Up Your Birthday!